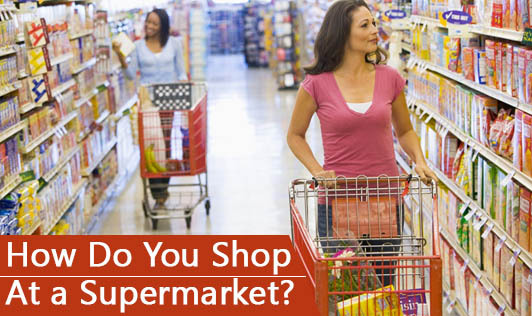 How do you shop at a supermarket? With so many supermarkets coming up, shopping at retail stores and buying products from brands which our mother and grandmothers used have almost come to an end. We have started experimenting with the food that we cook with, trying different products from different brands, trying new, processed or ready-to-eat products, and buying variety of sauces and dressings for salads and sandwiches. These products are easily available in supermarkets and are clearly visible to everyone. We don't have to ask anyone for anything; whatever we need (or don't need) are all lined up in huge aisles waiting for us to pick them up! We get so tempted to buy them that we don't think of the nutritional value or the health risks they pose even for a second! So, here are a few tips for you to shop healthy at a supermarket and keep your pockets from getting emptied. • Make a list of the things that you need to buy before you go to the store. • Go straight to the aisles where the products you need are available. Do not linger at any other aisle as they end up tempting you. • Never go to a supermarket for window shopping! You will probably end up buying more things than when you go for a "planned" shopping! • Do not go to a supermarket when you're hungry. You will end up picking up a lot of junk food! Make sure you eat and then go. • If you have only 1-2 things to buy, go to a retail store. • Send someone who doesn't like to shop. They will end up buying only the things that you need! • Do not use your card at the store. Always take cash and make sure you don't carry too much of extra cash. • Look at the labels before you buy new products. Check nutritional value and the ingredient list before buying. If it has anything in it which may affect your health, do not buy it! • Buy known and trusted brands to avoid food poisoning. The next time you go to a supermarket, make sure you come out with a bag of healthy food!